NetApp Cloud Sync is integrated with NetApp Cloud Volumes Service for AWS to enable fast data syncing over NFS to or from a cloud volume. A Cloud Sync data broker enables you to create a Cloud Sync relationship for syncing data. 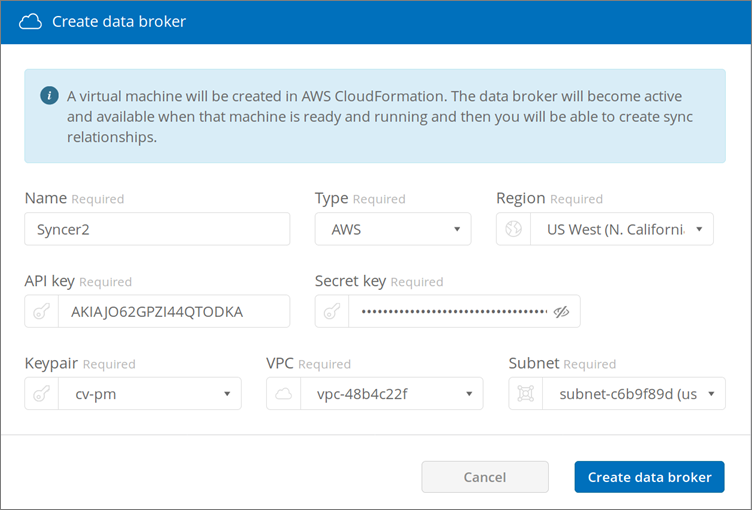 If you already have a Cloud Sync data broker in the same AWS Virtual Private Cloud (VPC) that you use for your Cloud Volumes account, you can skip this task. Go to the Sync page or the Sync tab for a volume on the Volumes page. Create a data broker by clicking Create data broker. Provide a name for the data broker. Provide the access key for your AWS account. Provide the secret key for your AWS account. The keypair will be updated after you enter valid keys. Select the VPC that is connected to your Cloud Volumes account. Select an available subnet to use for the data broker. Click Create data broker to start the data broker creation process. It takes a few minutes to create a data broker. After the data broker is created, it is marked with a green dot to indicate that it is ready. Continue with Creating a Cloud Sync Relationship.